He wasn’t classically handsome and had none of the usual “leading man” characteristics. He didn’t need them. His richly appealing “everyman” persona never failed to draw viewers in. You immediately liked and trusted him. What better qualifications could one need to take a plunge into the far corners of the fifth dimension? Rod Serling (“A Passage for Trumpet”, “In Praise of Pip”) and writers such as Richard Matheson (“Death Ship”) and George Clayton Johnson (“A Game of Pool“) knew that viewers needed likeable characters to identify with as they spun their tilted tales. Klugman was more than qualified for that task. Who can fail to be moved when he pleads for his old boss to give him a second chance in “A Passage for Trumpet”? Or when he’s overjoyed to find his dying adult son is a 10-year-old boy again? Every great Twilight Zone started with a great script. But it took talented actors to breathe life into them — and Klugman was one of the best. May he rest in peace. 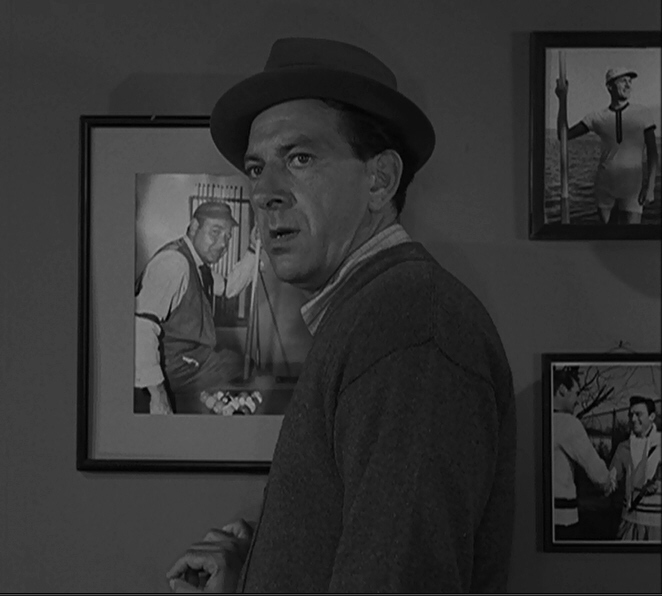 Posted on 12/24/2012, in Twilight Zone and tagged A Game of Pool, A Passage For Trumpet, Death Ship, In Praise of Pip, Jack Klugman, Rod Serling, Twilight Zone. Bookmark the permalink. 13 Comments. Special remembrance for the New Year’s Eve Twilight Zone Marathon this year for such a great actor and fabulous addition to Serling’s universe. Such sad news. Agreed! It’s as hard to imagine the fifth dimension without Jack Klugman as it is without Burgess Meredith. So many gifted performers did their best work on TZ, and Klugman is high on the list. Mr. Klugman–you will be missed! You were an incredible performer! Thank you for spending your time on Earth with us…and in the Twilight Zone. Say “Hi!” to Mr. Serling for us. Thinking of Serling and Klugman together certainly takes the sting away, doesn’t it? What great stories they must be swapping now! I frequently wonder what the dead must be doing…. Also the last of the original “Twelve Angry Men”. Looking forward to the marathon NYE! It’s the end of an era, no question. At least Klugman’s work will live on in future marathons. I’m not a big fan of any of his episodes (or him in general, to be perfectly honest), but much like Burgess Meredith, I can still appreciate the talent he possessed. It’s always sad to lose one of the originals. But he’ll live on through the miracle of television. See you during the next marathon, Jack! Definitely. I think what drew most people to him was that mixture of “everyday guy” with a passion to do the right thing. But it always felt like he was playing himself, so if that didn’t appeal to you, I guess you were out of luck! But I always liked him. I enjoyed him on “The Odd Couple” and “Quincy,” so it wasn’t hard to really appreciate his work on TZ. And yes, so glad we can see him every marathon!